Tomorrow, rehearsals begin at Seattle Opera for The Barber of Seville. Over the coming weeks we'll be exploring what promises to be a fantastic production here on our blog, interviewing the singers and creative team, checking in on rehearsal, and learning a thing or two about this most popular of all comic operas. Today, a refresher on the original Figaro: Pierre Augustin Caron de Beaumarchais, who created the character (based on himself) in a famous series of plays. Monsieur de Beaumarchais was the son of a middle-class watchmaker named “Caron”, and when he was a teenage apprentice in his father’s workshop they called him “fils Caron,” or “Son of Caron.” The nickname stuck, and eventually became the name of his fictional alter-ego, Figaro. 1) The Barber of Seville, a high-energy comedy based on ancient models, in which the wily servant Figaro helps the young and dashing Count Almaviva rescue the beautiful Rosina from the clutches of her tyrannical guardian, the old and foolish Dr. Bartolo. 2) The Marriage of Figaro, first performed in 1784, was the most popular (if not the most important) play of the eighteenth century. According to theatrical legend, the king of France, who feared a public uprising, had held up the performance; but he relented when his wife, Marie Antoinette, championed Beaumarchais’ work. (Apparently, she loved the plays so much she put on a performance of The Barber of Seville at Versailles starring herself as Rosina.) Three people were reportedly trampled to death in the line to buy tickets to the first performance of The Marriage of Figaro. 3) The Guilty Mother, Beaumarchais' third Figaro play, is a sentimental story which has never become widely popular outside of France. In it, Léon, the son of the Countess (fathered by Cherubino, who has since died in battle) loves the illegitimate daughter of the Count, Florestine, but the villainous Bégearss (a nastier version of Basilio, just as Hagen is more dangerous than Alberich) makes them believe they are biological brother and sister. This play, which also inspired a couple of operas, isn't as funny as the first two Figaro plays. In its plot, Figaro again saves the day at the end, although he doesn't have the spark that made him so popular in the earlier chapters. Like his Figaro, Beaumarchais was a jack-of-all-trades, a guy who tried a little of everything, constantly got himself in over his head, and somehow managed to come out on top nevertheless. 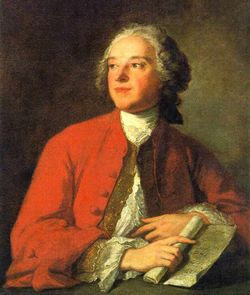 He started as a watchmaker but went on to become a writer of pamphlets and a publisher, a courtier, a teacher, a financier and philanthropist, a famous litigant, an untrustworthy member of the French Secret Service, a playwright who established the idea of author's copyright, and an important figure in the American Revolution. ...or the slimy, sycophantic toady Don Basilio, who I’ve always thought was Figaro/Beaumarchais’s arch-nemesis because there but for the grace of his extraordinary pride would go Figaro/Beaumarchais himself. You can find lots more information about Beaumarchais in books and on the web; but let me recommend the 1996 movie Beaumarchais l’insolent, one of my all-time favorite bio-pics. This terrific French film, directed by Edouard Molinaro, has all the gorgeous eighteenth-century costumes, locations, and music an opera-lover could possibly want, plus it stars the great Fabrice Luchini as the mercurial Beaumarchais, Sandrine Kiberlain as his adorable muse, Manuel Blanc as his loveable amanuensis, and such familiar French actors as Jean Yanne, Jacques Weber, and Michel Serrault as Beaumarchais’s many friends, enemies, and contemporaries. I’m sorry to say it’s not yet available as a Region 1 DVD, but you should be able to find it in US video rental stores on VHS.